To many fans of baseball, Alex Rodriguez is not known by a nickname that would seem to indicate that he is the power hitter his stats seem to show that he is. He known by those fans as “The Cooler.” That’s because A-Rod, as he is also known, is notorious for being signed to hot baseball teams only to find that once those teams have him on their roster, things go cold. Whether or not that is fair, or has anything to do with Alex Rodriguez, is not really known. Despite this criticism, there is little doubt that the man knows how to play baseball. He is also a prodigious home run hitter. He is a man poised to break some major league baseball records if he can remain healthy and continue to produce the run, which is a major question. As things stand now, A-Rod has 644 career home runs. By any standard that is impressive. He also has 312 stolen bases, which means he is a dangerous opponent to pitchers even if he gets on base, and makes him risky to walk. He has an overall stat of 2,852 hits and 1,867 runs. 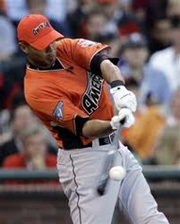 A-Rod has also appeared in a number of All Star games. Once again, however, his stats in some areas in the All Star Game leave many fans wondering what happens and if he really puts forth his biggest effort. Despite being a huge home run hitter, and participating in a number of Home Run Derby’s at past All Star Games, he has never won a Home Run Derby Championship. Again, many wonder if Alex Rodriguez is only willing to put forth effort when it boosts his income or his stats. One thing is definite and many feel should qualify A-Rod for the Hall of Fame. He has earned his ticket into the 500 Home Run club. His current stat stands at 642 homers. It seems that, if he can stay healthy, that he could end his career by breaking the 700 home run barrier. Again, this is the kind of statistic that would normally guarantee his placement in the Hall of Fame. When you break down A-Rod’s career, he seems likely to be remembered as one of the greatest players of all time. His legend may be that of a “cooler”,’ but the stats show that he is a consistent player and an addition to any team that he ends up playing for. For many baseball fans, the sour grapes and name calling may just be because he doesn’t play for their team. These days it’s just the matter of staying healthy and continuing to produce that keeps A-Rod busy. He had a slow start to the 2012 season. He has since overcome that slump and continues to produce. In June of 2012 he hit his 23rd career grand slam which has now tied him with baseball legend Lou Gehrig for the most grand slams in major league history.